Open Dental has several internal sheets that can be copied and customized for your practice. In Sheets, click New, or double-click an existing sheet to Edit. A background image is used for the static text (black). Input fields and checkboxes (blue) have been superimposed on the image to indicate data entry areas. The input fields correspond to fields in the database. If completed electronically, the entered data can be Imported into the database. Mobile: Click to view mobile optimized version of sheet. Edit Properties: Click to make changes to Sheet Def Properties (e.g. name, default fonts, page orientation, page size), click. Add or edit Sheet Field Types. To edit a field or element, double-click on it in the preview, or double-click on it in the Fields list. To edit an image or line, double-click on the item in the Fields list. 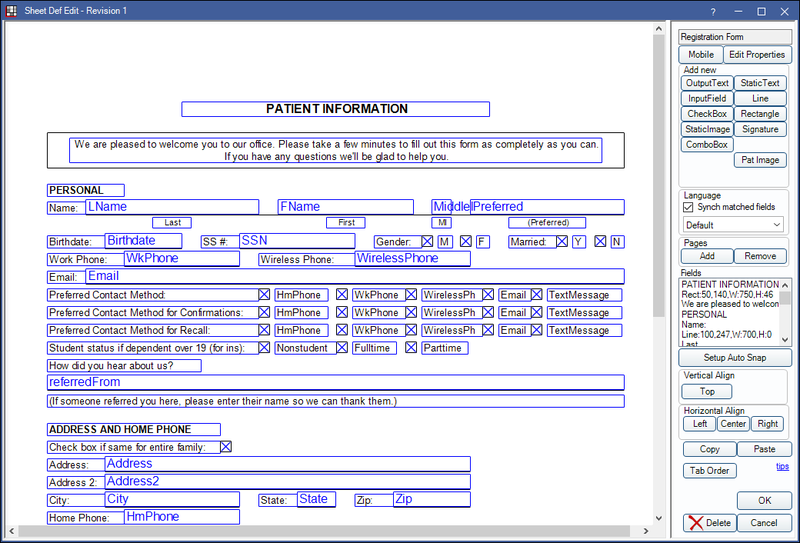 To set up fields that can be imported into the database, see Medical History Layout or Patient Form Layout. To select multiple fields, press Ctrl while clicking. To move fields, drag them with the mouse, or use the arrows on the keyboard. To move the fields in large increments, press Shift while pressing the arrows. 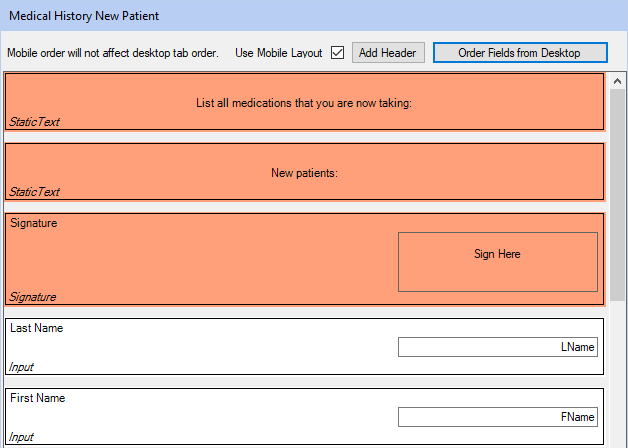 Use Mobile Layout: Check to enable mobile version of sheet for use with Web Forms. Add Header: Click to add a header to the mobile layout of the sheet. Double-click a Sheet Input Field to edit. If using a sheet for Web Forms Feature, the view of the sheet is dependent on the browser the web form is viewed in. If a browser doesn't support a font, a different font will be substituted. This can affect layout of the sheet. We recommend using common fonts (e.g. Times New Roman, Arial, Courier) and testing sheets on a device and browser you plan to support. If fonts are substituted, Static Text Fields may need to be larger to fit all text. Single Page Sheets: If a single page sheet, make sure all fields and elements are located within the page. Create a pseudo margin so you have room on the right or left side of the form. Add checkboxes as the initial boxes and a signature box at the bottom. Patients can check the boxes, then sign at the bottom to establish identity and acknowledgment. If using touch screens, use Rectangles larger than checkboxes, labeled 'initials'. Customer can then use a finger or stylus to initial. Checkboxes are usually sufficient for an electronic form because electronic signatures will be invalidated if the state of a checkbox changes (e.g. from unchecked to checked).